A new booklet was published in the Gödel Series on the topic of the ARRL (Assured reliability and Resilience Level) criterion. Developed by Altreonic, ARRL is complementary to the traditional Safety Integrity Levels but is domain independent. It aims at a criterion that acts as a contract for the reuse of components and (sub)-systems in the context of trustworthy systems engineering, in particular for safety critical systems. It achieves this by taking faults and how the component or system deals with it, into account. The booklet is available from the download section. Autonomous vehicles will change the way people lead their lives and move around in cities. There is a likely possibility that self-driving technology will cause a shift from a private to a shared mobility service. The disruptive nature of automated Mobility as a Service (MaaS) is comparable to what internet did for information and communication (bringing it down to a low marginal cost). This time however, the impact will be deeper as it impacts us much more physically. At the same time, it solves a real problem as people are increasingly gridlocked in traffic. But, how will this likely disruptive transition impact other modes of transport, our society and the economy? Since 10th August 2015, Altreonic's operational offices are located at: Staatsbaan 4A/1, 3210 Lubbeek, Belgium (close to Leuven, 30 minutes from Brussels. See the contact page for details and an access map. The new offices are an important step towards further development of the e-mobility KURT product group. An updated version of the booklet on "Trustworthy Systems Engineering with GoedelWorks 3" is available for download. It now contains a chapter on the ARRL criterion and describes the details of the extended GoedelWorks’ metamodel. The latter describes a generic metamodel for Work Packages. New features are illustrated with a concise description of the OpenComRTOS Qualification Project. The booklet can be downloaded from the GoedelWorks page. The Federated Conference on Computer Science and Information Systems (FedCSIS) (IWCPS'15) Program Committee has accepted the paper “Simulation and Formal Modelling of Yaw Control in a Drive-by-Wire Application” for 2nd International Workshop on Cyber-Physical Systems, Lodz, Poland, 13 - 16 September, 2015. The paper was the result of a cooperation between Altreonic and Prof. Richard Banach (Manchester) who will present. We are pleased to announce Eric Verhulst, CEO/CTO of Altreonic NV, as one of the Keynote speakers at CPA 2015. Eric led the development of the Virtuoso multi-board RTOS, used in the ESA's Rosetta space mission to comet 67P/Churyumov-Gerasimenko. Virtuoso was the first distributed RTOS on the transputer and its successor developments — such as OpenComRTOS, a formal redevelopment from scratch, and VirtuosoNext, featuring fine-grain space partitioning — all apply the valuable principles and lessons learned from CSP, the transputer and occam. Altreonic will also host a workshop on "Dealing with (Real)-Time in Real-World Hybrid Systems” and fringe session on "Protected Mode RTOS, what does it mean?". All presentations are now attached. Title: "occam's Rule Applied: Separation of Concerns as a Key to Trustworthy Systems Engineering for Complex Systems"
"Keep it simple but not too simple" means that a complex solution is really a problem that's not very well understood. Altreonic will be present at E² Tech4Cities Brokerage Event during the EU Sustainable Energy Week 18th June, 2015 in Brussels. Come and meet us to discuss and investigate partnerships in the context of our light-weight e-vehicle for urban environments. 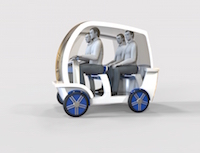 A few possible scenario’s to recover our mobility in the city. Mobility and communication are two essential mechanisms for social interaction. They also determine how efficient economies can operate. This is why people often tend to live and work in cities or locate their activities in close proximity as it shortens the interaction distance. Communication has seen a revolutionary evolution in the last decades. We are now virtually reachable anywhere, any time of the day and sharing information is a click away. There is so much data being generated and available that we need smart applications to filter the essence from the noise. While internet and high bandwidth have brought down the cost of communicating to a very low marginal cost, the same cannot be said about our cost of moving. Of course, this is not a universal statement. Long distance travel, using airplanes and ships is more efficient and safe than ever. Even cars have become relatively cheap if one takes into account the comfort they now provide. What is hampering the economy is the mobility at city level. Unless we move out of the cities again, what is unlikely to happen as cities are spreading from the suburbs, we need to find solutions to give us again the mobility we need. Even with all avatars in the world humans need face-to-face interaction. Altreonic is proud to announce the first version of VirtuosoNext™ which provides fine-grain Task level space partitioning. This allows protecting individual Tasks from each other, i.e. preventing one Task from corrupting the memory of another Task. Such protection can be crucial for the development of high reliability systems that must be kept running even if one Task becomes corrupted. The scheme has a small memory overhead while keeping the real-time scheduling support of a traditional RTOS. For a new H2020-FTI proposal consortium, we are looking to add potential end users to a panel of experts to share ideas and experiences in Intelligent Transport Systems and Sustainable Mobility.